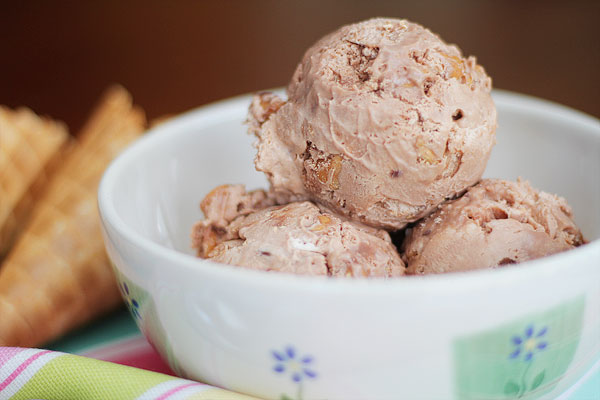 Easy to make, yummy to eat ice cream that can be customized to suit your own taste. It's relatively cheap and requires little baking / cooking expertise, and also makes a fair amount given the minimal effort exerted to make it - I made roughly 3L. Pour thickened cream into bowl, using a whisk or electric beater to whip until soft peaks form. Add sweetened condensed milk and vanilla essence, continuing to whip until thoroughly mixed. When removing the whipping utensil, the ingredients should almost hold their form. Add flavouring and continue to whip until mixed or fold through. If using ingredients which have a juice or liquid accompanying them (such as canned mangoes) drain liquid first. Use the spatula to scrape the sides of the bowl clean and smooth over the top of the ice cream. Place in freezer for 2-3 hours, then fold through mixture if desired to lift ingredients such as fruit off of the bottom. Place back in freezer and freeze overnight or until solidified. November 22nd, 2016 at 01:49am, fala amo.